First Time I had been on a Boat, The Trapeze Broke! It was the first time I had been on a yacht. Young, trim, tanned and so full of life! Beautiful day, calm water and enough wind to allow a decent sail. We waded out to this magnificent looking yacht and hauled ourselves in. This was going to be such a great experience. Unfortunately I can't remember much of the day since then as this is what happened. We were all taking turns at the trapeze and it did look a little scary to me. But I was assured that all would be fine. Before I knew what had happened I had fallen into the water, the yacht was sailing off into the distance and I was treading in some very deep and dark water. Do you know, I am unable to remember the rest of the day. I must have survived as I am here typing some 43 years later. Me go out on a yacht again...yes please but never, ever, ever ask me to do the trapeze! Comments for First Time I had been on a Boat, The Trapeze Broke! I hope the experience didn't put you off sailing forever and I hope you gave that physics teacher a piece of your mind, when you got back on the boat soaking wet. To be honest, you shouldn't have been allowed out on the water without being able to swim, just in case these sorts of things happen. Thanks for an interesting story Marylin! Hope the experience didn't sour your interest in sailing. You live in a great place to sail! It didn't put me off! 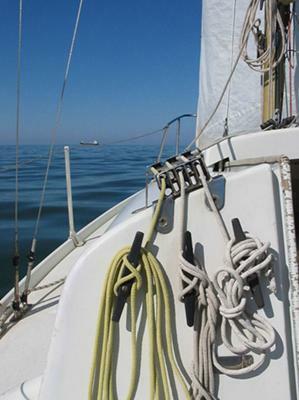 I want to eventually learn some basics about sailing. A dream of mine is to sail the Whitsundays...I think I will need a skipper for that one though. My favorite scene in Shirley Valentine is when she is on the yacht in Greece. She is lying with her Greek Adonis, naked, after having just ridded herself of [most] of her inhibitions and cares. Now that's a good plan! Great movie, great scenery, great story line. Hmmm...sailing the Greek Islands, yes please! I remembered what happened, I swam back to shore! I think I filled the bay up more with my tears on the way in...never mind, it didn't put me off!